Mistaking the symptoms for the cause? The news this weekend that Viet Nam’s state has sentenced two state-linked businessmen to death on corruption charges is, in and of itself, unsurprising. We would expect as much in Viet Nam or indeed in any authoritarian polity, as in such polities it is normal for authorities to respond to perceived existential threats with attempts to demonstrate the state’s absolute power. Whether and to what extent corruption poses a genuine existential threat to Viet Nam’s current leadership is debatable. 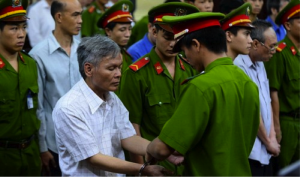 What these death sentences and those that may follow do seem to demonstrate is that Viet Nam’s state emphatically lacks the sorts of power it needs to address the plague of corruption that now so threatens the country’s growth prospects. To understand why requires that we appreciate three important features of Viet Nam’s political economy that are not widely grasped by those unfamiliar with the country. The first of these features is that power in Viet Nam, though commonly assumed to be centralized (particularly given the presence of a Leninist party-state) is in fact profoundly decentralized and has grown even more decentralized within the past two decades. Yes, Viet Nam’s political institutions are highly centralized. But the ways in which political and economic power and influence are exercised are not. Yes, local authority in Viet Nam has always been resistant to central power. But within the last two decades, Viet Nam’s central state has become increasingly captive to local interests. Indeed, local officials have ascended to the commanding heights of state power and have been instrumental in pushing forward programmes of administrative and (limited) political decentralization and well as quasi-privatization of state enterprises. The net effect has been great increases in the powers and discretion of provincial political bosses and high-ranking enterprise managers. Regulatory measures to ensure transparency or accountability have been week or absent. This, in an environment of rapid economic growth, cheap credit, and seemingly limitless economic opportunities for wealth accumulation has produced levels of corruption and shadiness not seen in Viet Nam since the colonial period. Indeed, Viet Nam today displays the features of a highly decentralized patrimonialist regime that is largely resistant to higher authorities, let alone regulation. The second feature of Viet Nam’s political economy is that Party discipline is less strong than imagined. Many, perhaps most members of the ruling party in Viet Nam are complicated though honest people. It is impossible to deny, however, that a great deal of corruption in Viet Nam has swirled around Party members and ‘party people.’ This, as Lord Acton has suggested, is not surprising. Absolute power corrupts absolutely. Without checks or balances and absent the rule of law, those in positions of power, whether in Viet Nam or elsewhere, tend to brazenly use their political power for personal financial enrichment. The price of corruption in Viet Nam is steep. Its sorry result has been profligate waste. In Viet Nam, a country ripe with potential but in dire need of skilling and appropriate infrastructure, corruption has meant that hundreds of million and perhaps billions of dollars have been siphoned out of state coffers and out of the productive economy into non-deserving pockets and into non-productive outlets, such real estate speculation and conspicuous consumption. A third and final feature of Viet Nam’s political economy Vietnamese of all brands, including many within the party-state apparatus are deeply alarmed by the specter of corruption. Disdain for official corruption in Viet Nam has grown. After two decades of remarkable progress in poverty reduction, real improvements in Viet Nam ‘s living standards have slowed. Economic vulnerability remains acute among large segments of the population. On the other hand there has seemingly been no slowdown in the sales of Bentley automobiles and the like, a fact not lost on the Vietnamese street. It is true that various forms of corruption – from petty to grand – have become institutionalized rules in the context of a market economy. In fact, corruption in Viet Nam, however complex, is in fact merely the symptom of more fundamental causes. For the most fundamental threats to Viet Nam’s prosperity are not greedy officials but the presence of institutions that allow for and encourage corrupt practices. Which is to say Viet Nam’s main deficit is institutional. One can concur with principled persons who lament corruption in all its forms. On the other hand one may not deny that even large-scale corruption can, under certain cases, coexist with and even propel economic growth. The cases of Wen Jibao and Xin Jin Ping come to mind, as do the robber barons of the United States, past and present. When the gallows open they tend to do so for political reasons. The Vietnamese are proud people and their country has befitted enormously from two decades of sustained economic growth. Now that economic growth is sputtering in the face of corruption and political near-sightedness, the country requires farsighted leadership. More than death sentences, Viet Nam today requires political leadership and a determination by all Vietnamese to achieve a society in which principles of fair play apply to all, regardless of their status, rank, or party.